This is Red Bull Racing's launch video for their 2013 F1 car. It shows an obsession with high-tech manufacturing on par with Metropolis. Meet the RB9, the car Red Bull hopes will net them yet another championship in 2013. The problem with Formula One is that the technology is so advanced, that it's hard to get a sense of what the cars are actually made of, and what they're doing. Well, this video shows you perfectly. We can't stop watching them make the transmission. 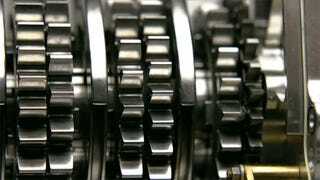 There's something about those tiny gears and forks coming together like a watchmaker's high-speed fantasy.